We sat down with Cara Jaffee, CNTP, a Denver-based nutritionist, author, and educator. 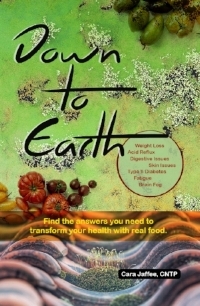 Cara recently published Down to Earth: Find the Answers You Need to Transform Your Health With Real Food, a detox protocol based on eating quality, whole foods. Q: So, Cara, what is a detox protocol? Detoxification or “detox” has been around since ancient times, and often aligns with the changing of seasons. It is meant to help rejuvenate cells while decreasing inflammation in the body. Q: Why might someone consider a detox protocol? Detox protocols can be a great way to jump-start weight loss, relieve digestive concerns like acid reflux, increase energy, and strengthen the mind-body connection. Q: What do you mean by the mind-body connection? The thoughts, beliefs, feelings, and attitudes one has affects physiology (or the way our body functions). By understanding more about food, food quality, food timing, food combining, detox, and inflammation, the more we are empowered to take control of our health and well-being, both mentally and physically. Q; What should someone expect to experience on a detox protocol? In a matter of days, you will start to positively impact your physiology. Many people will notice this affect immediately, while it may take others longer to feel change. Q: What makes the Down to Earth protocol different from the other ones out there? The Down to Earth program is designed to keep you satiated and provide training on sustainable eating for increased health and vitality. This book will help you shop grocery stores and farmers markets with a better understanding of what foods will best fuel brain power and feed your family safely. You will learn fact from fiction when it comes to food and sustaining health. The Down to Earth protocol also includes tips on how to succeed, sample meal plans and recipes, and resources and tools to enhance your detox experience. Q: What happens after you complete the Down to Earth protocol? You will be guided through food reintroduction to see if any food sensitivities can be identified. Unidentified food sensitivities add to internal inflammation and aggravation in the body. Q: Our readers are itching to know: what foods can you eat on the Down to Earth protocol? You will be focusing on real and whole foods. If it doesn’t grow in the ground, roam the earth, or swim in the sea, you will avoid it at all costs! It’s easy to customize when on-the-go or eating out, too. Q: Are snacks allowed on the Down to Earth protocol? Thank you for all of the great information, Cara! Want to win a free copy of Cara’s book along with a jar of Unwrapp’d? Check out the Unwrapp’d Instagram account for info on our giveaway with Cara! 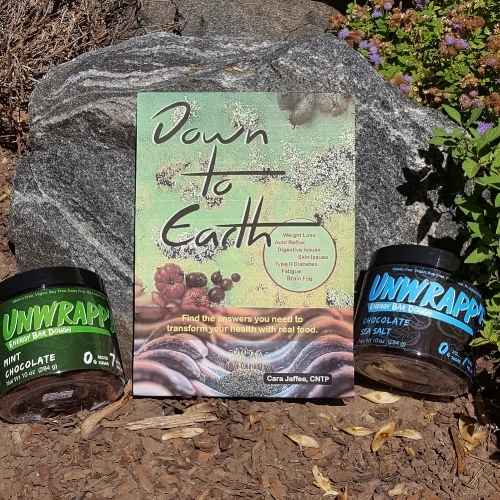 For more information on the Down to Earth protocol, click here, and connect with Cara at Premier Nutrition Therapy.